We all know how awesome the new Fusion virtual tour system is; how amazing the Fusion virtual tours are. It’s time to tell your clients what specifically makes a Fusion virtual tour unique. The first marketing piece this month was intended for real estate agents to share with potential clients during a listing presentation. 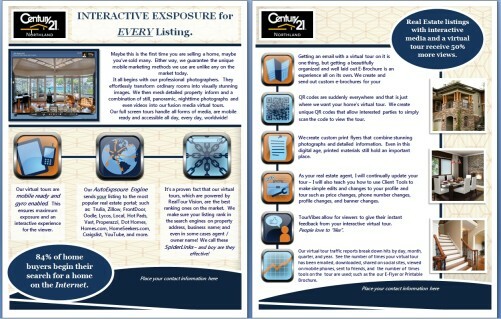 As always, it is easily customizable by the agent or you, and details what unique property marketing methods they use. We set this piece up to hit some of the most important features for BlueLaVaMedia here in Traverse City, but you’ll notice that you can easily swap out icon is you feel some of the other features in Fusion are better for your market. This virtual tour marketing piece is reassuring and informative to potential property sellers. We encourage you to make any necessary edits to this piece and send a copy off to each of your customer to include within their listing presentations. The second virtual tour marketing piece this month is a quick one page flyer that focuses on our AMAZING Fusion Exposure Engine. It’s a perfect piece to customize, send off to VistaPrint and have a few on hand when you walk into any office. Use this virtual tour marketing piece to guide your customers and prospects through your syndication sites to your SpiderLink technology and finally back over to your amazing weekly virtual tour traffic reports. Login to your RockPointeMarketing Account today and snag these two amazing new pieces! Hope you are all off and running with the new Fusion virtual tour system. Remember if you’re not setup on Fusion RTV is unable to send you virtual tour dispatches or leads. Get setup on Fusion today!! you real soon. Remember, we’re in this together! Hi Team RTV! Just wanted to let you know that the new Fusion virtual tour system is making a big difference in how our local Realtors are considering using virtual tours in the Telluride, Colorado market. In the past old opinions were making it hard to get clients to use virtual tours, But FUSION is opening up new doors as we’re really able to market this product as something far beyond virtual tours. The Interactive Virtual Media Presentations are stealing the show here in Telluride. 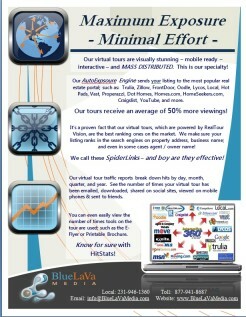 Thanks so much for giving my virtual tour business such a HUGE boost. Hello all you RTV virtual tour provider. We’ll Digital Imageries LLC is proud to announce the addition of aerial photography to its many property marketing services. Our Spokane virtual tour company uses state-of-the-art Quadcopters as a flying platform, we are able to take amazing pictures of your property, project or business. Quadcopters are the ideal platform for taking pictures or videos from a height where details can be emphasized making it ideal for real estate, farm land, and aerial surveys. Stop on by our website today and check out some of our amazing Fusion virtual tour presentations. In addition to providing the best in 360 panoramas, we now include, video, social media integration, floor plans,narration and aerial photograpy in your virtual tours at a reasonable and cost effective price. Check out the amazing features and order your tour today! At our assisted care photography business we have had a flat price for our residential real estate virtual tours. This made it easy for us in the past because each virtual tour was a combination of still and panorama images and we like having the freedom to showcase each home in its best light rather than having to pick and choose which areas to photograph and charge on a per photo or spin basis. Fusion — the latest virtual tour software platform from RTV, Inc., has essentially changed the way that we think about virtual tours and has presented us with so many additional bells and whistles that we had to reevaluate our virtual tour pricing options. In the end, we decided to keep the base price of a residential virtual tour the same but offer up sell opportunities that would increase the price of the tour should the agent choose to select these add-ons. Our base tour price of $100 for our local real estate market includes the basic virtual tour and our social ignition package. The social ignition package includes distribution of the tour to over 40 social bookmarking sites as well as a YouTube video and Craig’s List ad. We are offering several $25 upgrades that allow each Realtor to customize their virtual tour package. Many of our Realtors choose to upgrade their virtual tours to include a stills package. For an additional $25 we will guarantee 25 still images in addition to the handful we use in the tour. When searching the MLS listings, most people search by price range and number of bedrooms and when sorting the results, they choose first to see the listings with the most pictures. Since 25 is the maximum pictures our Realtors can upload with a listing, they want to make sure that they rank high in these searches. Getting 25 still images can be difficult on smaller houses but we have gotten great responses from home buyers and Realtors alike. Other add ons that are available are automated scene narration which we will include for an additional $25 with a client provided script. This general or scene by scene narration allows the seller to showcase individual features that may not otherwise be obvious when looking at the pictures. While scene narration provides additional information, it also captures and holds the viewer’s attention better than the typical background music that normally accompanies our tours. With each virtual tour comes the option for flyers — both an e-brochure and downloadable graphic intensive flyers. The flyers are included in the base price of the tour but if the Realtor wants us to customize these flyers for them, we can do so for an additional $25. The agent has access to these features within the new tour delivery system however some of our agents aren’t comfortable doing these things themselves. For listings that the agent really wants to attract attention to, we offer the option of a single property website. While the virtual tour provides a 24/7 open house, the single property website goes a step further by inviting people to go directly to the website and view the virtual tour AND learn more about the listing. Other features that are available include virtual staging, integrated video and customized hot spots. The price for these varies depending on the size and scope of the additional feature. We do not want to “nickel and dime” our Realtors but we do feel that allowing them to customize their tour to suit their particular needs was a better choice in our market than raising prices across the board. We do offer an “All You Can Eat” option that features the virtual tour plus single property website, flyers, voice over with client provided script, interactive floor plan with client provided floor plan for a flat price of $200.